screening test will be conducted for this APPSC FRO jobs on 24-02-2019. After screening test Mains Examination will be conducted for this AP Forest Range Officer jobs on 28-04-2019, 29-04-2018 and 30-04-2019. Online application links active dates for this APPSC FRO Recruitment Exam Notification is 10-12-2018 to 31-12-2018. 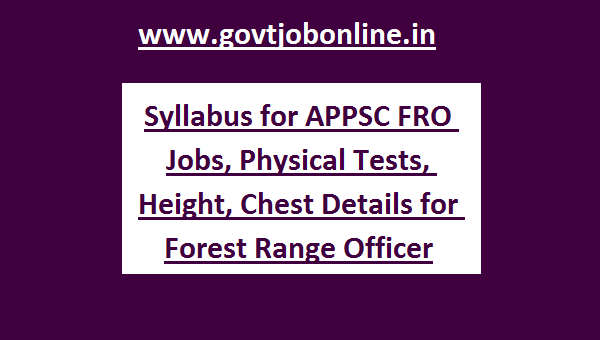 AP Forest Dept Forest Range Officer Posts Exam Pattern and Exam Syllabus, physical test details are given below. APPSC FRO Jobs recruitment will be based on screening test /preliminary exam, Mains Exam and Physical Tests, Medical Exam and Computer Proficiency Test. 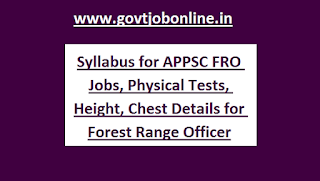 Screening test will be conducted for 150 marks for this AP Forest Dept FRO vacancy recruitment 2018. Exam Duration is 150 minutes for this FRO jobs of APPSC recruitment 2018. Exam Paper will be Objective type and OMR Based. Computer Proficiency test will be conducted for 50 marks. Exam duration is 30 minutes. For Male-25 Kms walking to be completed in 4 hours. For Female-16 kms walking to be completed in 4 hours.